Top notes - Galbanum, Bergamot and Cardamom. Middle notes - Rose, Jasmine, Incense and Cinnamon. Base Notes - Indian Sandalwood, Patchouli, Vanilla, Tonka Bean and Amber. Black Jade by Lubin - A black jade bottle held the last remaining scents of a secret garden. The discovery of its formula, copied by an indiscreet apprentice, revealed its mysteries. It belonged to a queen in the Trianon rose gardens, far from the splendors of the Court, before the turmoil of history was unleashed. Entrusted to a noblewoman and very dear friend, it has come down to us through the ages to be reborn today. Galbanum, bergamot and cardamom provide a fresh prelude to the rose and jasmine heart notes, enhanced by a hint of incense and cinnamon. The amber base, anchored in exotic woods, Indian sandalwood and patchouli, is arrayed in vanilla and Tonka bean. But the young Lubin was also interested in a mysterious perfume that the queen had ordered from Jean Louis Fargeon during the creation of the Trianon gardens, her private domain. The roses in the recipe of course evoked the flower garden, and are combined with jasmine from Grasse, but the use of spices and noble wood imported from distant lands, those that inspired the motifs of the wall decorations at Versailles, gave it more exotic tones. Precious patchouli and sandalwood, vanilla and cinnamon, coriander and cardamom, frankincense and galbanum were brought from India and French islands beyond the seas. With these ingredients, the initially cool floral fragrance became mellow and warm on the queen’s skin. It leaves a discreet trace with notes of amber, elegant and sensual. The queen took it everywhere in a small flask of black jade that protected it from daylight. In the house of Lubin, the once lost but now resuscitated fragrance for a long time bore the name of “jardin secret”, until the 1930s, without any explicit reference ever being made to its origin. 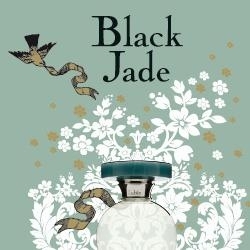 We have now restored its name of the time, “black jade”, the one brought to us by a close friend to whom the queen gave the black flask with its nostalgic whiffs when they parted for the last time. It held the “secret garden” of a queen, the memory of her happy days, of spring evenings in the intimacy of the Petit Trianon, at Versailles, but far from the pomp of the court.